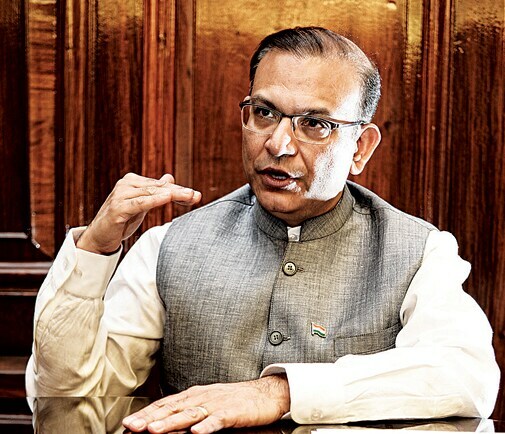 Business Today speaks with Minister of State for Finance Jayant Sinha about various aspects of the Union Budget 2015-16. The crease of his white kurta looks crisp enough to scratch the sandstones lining on the insides of North Block, the secretariat building that houses the finance ministry. 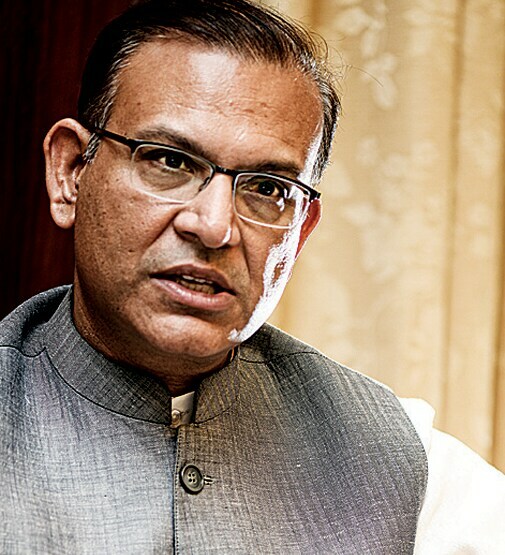 The tall and fit Jayant Sinha, 51, looks every bit a mantri, with a bit of help from his grey Nehru jacket. But he does not speak like one. Q. Is it correct to say that this Budget is the beginning of a long process of changes that must be done to kick-start economic growth? There are the issues of land acquisition, environment clearances, labour reforms? A. (Cuts in) First, let's see the context of this Budget. There are some bitter economic truths. A lot of our revenues go into servicing debt. Inflation had been running at eight to 12 per cent. India's tax-to-GDP ratio, fiscal deficit, and debt levels are at unacceptable levels. The 14th Finance Commission asked for a historic devolution, which, of course, we are in favour of. This fiscal year we had to go from a fiscal deficit of 4.7 per cent - many believed the real number was much higher because of the financial jugglery done in the previous budget - so in this fiscal year, from May till March 31, we were looking at a consolidation requirement of perhaps north of five per cent right down to 4.1 per cent. Revenue projections were way overstated. That's the context. We landed at 4.1 per cent is due to the fact that we were very-very fortunate in terms of commodity prices, specifically oil, and due to the very prudent fiscal management that we have done. The fact that the RBI has cut rates today is testimony to our prudent fiscal management. That's what we inherited. Even as we were dealing with these realities, we put a budget framework that covers everyone. We looked at the last 25 budgets and pulled out the five or six we think had the most impact on India's economic history. Two of them were by my father (Yashwant Sinha). Extraordinary as those budgets were, they had eight to 12 structural reforms. In this budget there are 15-20 high-impact, structural reform initiatives. We have significantly exceeded the best-in-class benchmarks. Since we came [to power] last year, the Nifty has gone from 6,000 to 9,000 - 50 per cent. It was a hope rally. To sustain that, give it new legs, and convert it into a conviction rally through the catalyst of the Budget was an extraordinarily high bar to meet. It gives us a great deal of confidence that, in fact, India is going to grow in a non-inflationary way at seven to eight per cent for decades. If we grow at that rate for 10, 12, 15 years, our $2 trillion economy can become a $4 trillion to $5 trillion economy. GDP to market cap tends to be 1:1, listed plus unlisted securities. If, indeed, GDP goes to $4 trillion, market cap will go up by $2 trillion. For investors , this is the most exciting wealth creation opportunity on the planet. Q. You mentioned the remarkable work done by some of the earlier budgets, including by your father. Now, your father had valiantly attacked the urea subsidy? A. I'm familiar with that. Your question is what we are doing about fertiliser subsidy. Q. Fertiliser and food subsidy. A. There is no way we are going to drop subsidy levels. We absolutely have to make sure that nobody goes hungry, nobody is deprived of kerosene for their lighting and fuel needs, nobody is deprived of the ability to grow crops. Now the question arises, how do we provide these benefits to those who need them in the most efficient way possible. We have the Jan Dhan Yojana - every Indian has access to a bank account. We have shown that as far as gas cylinders are concerned, we can make subsidies a lot more efficient. There were people who were getting 300 gas cylinders a year. A. Yes. There was no ceiling. The previous government, of course? there is no harm? and the right thing for India is to continue with the good idea of capping the number of cylinders. We have continued with the good idea of aadhaar. The missing link without which the whole direct benefits transfer could not work was bank accounts. In mission mode we tackled it and within four months made sure that every household had access to a bank account. And, of course, everybody has a mobile phone. So that is the JAM trinity we talk about. Q. The economic survey, too, talked about it. But there was not much in the Budget. A. Now the platform is in place to have much more efficient subsidies. We have demonstrated what we can do with gas cylinders. You pay market price. Then, if you want subsidy, it will be directly put into your bank account. Similarly, when it comes to food, fertiliser, kerosene, we are going to move forward using the same principles. Let's make sure there is a cap on it, there is no overuse, no leakage, and it goes to the targeted beneficiary. All government welfare schemes -Jan Suraksha, Jeevan Suraksha, Durghatna Beema, Atal Pension Yojana - are meant to go through the Jan Dhan accounts. (Gets up to grab a booklet of the Budget speech from his table, rifles through the pages, stops at page 44, and reads out.) "In sum, these social security schemes reflect our commitment to utilise the Jan Dhan platform to ensure that no Indian citizen will have to worry about illness, accidents or penury in old age." Q. You talked about keeping to the 4.1 per cent fiscal deficit target. Everyone appreciates that. But the revenue deficit remains high. Q. And interest payments, too, are at a record high. A. I think that is a misguided question, if I may say so. We have an unacceptably high debt level because we inherited a very-very difficult fiscal situation. We have had a worryingly high fiscal deficit, which had to be financed through issuance of government securities. Those build up over time. Therefore, we have to pay very significant interest expenses. With rates coming down now, some of that interest burden will ease. As we bring the fiscal deficit down, we will not add to that debt. Since the economy will continue to grow at seven to eight per cent, our hope is that we will be able to bring the debt-to-GDP ratio to a more acceptable level. We have to grow out of this trouble. You mentioned the revenue deficit. The fiscal deficit is very challenging. In addition, we have devolution where 42 per cent of the money is going to states. We still have to protect a whole host of expenses. A lot of those are salary-linked. As we move more to the states, we still have the central expenditures. The revenue deficit will go up because those things are being protected while the revenue is going down. So that ratio goes up, if you understand what I am saying. A. We recognise that the revenue deficit at 2.8 per cent [of GDP] is not great. Obviously we want that to come down. But it will take some time. We also want to increase high-quality spending, on capital expenditure, etc, which have a high multiplier effect, and are productive assets. We provisioned Rs 70,000 crore in the Budget for capital expenditure. Point two, we said that financing agencies like NHP and IRFC can issue infrastructure tax-free bonds. Item number three, which is a real game changer, is the National Investment Trust. I don't know if you picked that up, the National Investment Trust is going to get Rs 20,000 crore a year. You can lever that up. It can potentially have Rs 100,000 crore a year of dry powder to invest in infrastructure. There is plenty of capital in India. We just have to make sure that it is put to work wisely and effectively. Q. On the salary front, you may face a little more pressure once the Pay Commission? A. Pay commission, yes, absolutely. Q. The recommendations may come before the next Budget. A. Yes, we have to take that into account. The recommendations will come in, but they may not necessarily be implemented this fiscal year. They may be implemented from the next fiscal year. But it is right around the corner and that is also going to be challenging. Q. In the past that has proved to be about one per cent of the GDP. A. Yes, we know that. Q. About your projections, you are banking on 8.1 to 8.5 per cent growth in the GDP. But if you look at the other aspects of the economy - corporate profitability, tax collections, jobs growth - they don't seem to be keeping up with the GDP growth. A. Of course, the GDP growth now is set on a new base. Our revenue targets are quite reasonable at 14 per cent overall. In that we think our GDP will grow at nominal 11 per cent - between inflation and actual GDP growth rate. Taxes go hand-in-hand with nominal GDP. We are not assuming any tax buoyancy. The additional three per cent is coming only from the full-year impact of the excise increase on fuel. Since we instituted this only in the last third of the year, we have had this only for a third of the year. The one fair criticism would be that you are dependent on oil prices staying in this band, and we are looking at a band of $50 to $80. Q. There seems to be a growing divergence in this Budget between excise and service tax. Shouldn't they get aligned in the run-up to GST? A. We will have to look into that. Obviously, there is a certain amount of fiscal pressure. So we have to look at revenue enhancement on one hand. On the other, we have to go towards a revenue-neutral, flat, across-the-board GST rate as well. That alignment will have to happen over time. Q. For the purpose of signaling to the international community and national, did you debate if it would be wiser to stick to the fiscal deficit target of 3.6 per cent for next year, instead of letting it slip to 3.9 per cent? A. On balance we felt that the near-term stimulus that would come into the economy by getting this additional 0.3 per cent, focused on investment, was worth it. If we were able to achieve 5+ to 4.1 per cent, surely we could do another 30 basis points. The issue on the margin was, is this a wise investment with a high multiplier effect? In our considered judgment we felt that it was. Q. What is the thinking on plan versus non-plan expenditure? Plan has gone down, but non-plan, the not-so-good expenditure, has gone up. A. As far as plan expenditure is concerned, much of that has moved to the states, and therefore it has gone down. There are schemes that have been transferred fully to the states. There are other schemes where there is a change in the sharing pattern between the Centre and the states. Plan expenditure has effectively been devolved to the states. Q. The Prime Minister criticised the MNREGA strongly in Parliament. Yet, the next day, the Budget increased its allocation. What is the philosophy? A. The philosophy is extremely clear. What the Prime Minister said in Parliament is that the MNREGA has been used to dig holes. If we redesign MNREGA, it will continue to further our philosophy of a safety net, and it will enable us to build productive assets in rural infrastructure. It is not an entitlement programme, it is a safety net. This is a very big distinction between our economic philosophy and the UPA's. The UPA philosophy was focused on entitlement. We are redesigning these programmes like we changed the gas cylinder programme from an entitlement programme to an empowerment programme. Our job is to get better jobs and opportunities for you so you don't need MNREGA. We want to make sure everybody in India prospers, but in a sustainable, long-term way. That is the way to enable people to lead a dignified life. Nobody wants to be a ward of the state, nobody wants a nanny state. We don't want a povertarian mindset, which says we have to keep people trapped in poverty. We have to give people the tools, the skills, and the resources, otherwise we are not going to get wave after wave of growth. Q. Not much was done in the Budget for recapitalisation of public sector banks. A. You are quite wrong. I think you had a big article on banking. Everything you write, I'm going to read. What we have done [about banking] is very important. Let me read it out to you. (Rifles through the pages of the Budget speech and reads out loud.) "In order to improve the governance of public sector banks, the government intends to set up an autonomous bank board bureau. The bureau will search and select heads of public sector banks and help them in developing differentiated strategies and capital raising plans through innovative financial methods and instruments. This would be an interim step towards establishing holding and investment companies for banks." Is that a profoundly important step or not? A. I rest my case. There is a small provision in the Budget to put more money in the banks. The right question is how we improve the performance of these banks. If we improve their performance and ensure they have winning strategies, we are confident that with the use of innovative financial instruments they will be able to raise sufficient capital. The winning strategies can include a whole host of measures, including mergers and acquisitions. We believe the talent shortage is way more important than the capital shortage. As a custodian of people's wealth, why will I raise equity for these banks at the distressed valuations they have right now? (Looks at his watch) I'm out of time now. Q. One last thing. Did the Delhi polls influence the Budget? A. I would say only very marginally. We have had a very consistent economic philosophy and set of priorities that we are relentlessly executing. But in any political campaign, there are angles of attack that open up. And one of the angles of attack - which the Prime Minister addressed brilliantly in Parliament and in his speeches - is that are pro-corporate. A. And not pro-poor. We have always been pro-poor. I will commend you to listen to the Prime Minister's speech on May 20, 2014 in the Central Hall of Parliament after he was appointed the leader of the party in Parliament and therefore the PM. In that he said in a crystal-clear way: "Ye gharibon ki sarkar hai, aur jo hamari sarkar hai wo gharibon ko samarpit hai." If you ask me who has the first right to government resources? Whether it is the Delhi election, or the Jharkhand election, or the J&K election - nothing changes. People who have the first right to government resources are the poor and the deprived. You have to go out there and understand how difficult their lives are and how miserable and destitute they are. This is not our political priority, this is our moral responsibility. It is our raj dharma. What happens in any election cannot impact that overriding priority.